HOUSTON - The Houston Astros have homered so many times this season that Hank Conger thought they'd certainly hit a grand slam. It was only after he hit one one Saturday night that he learned it was their first this year. 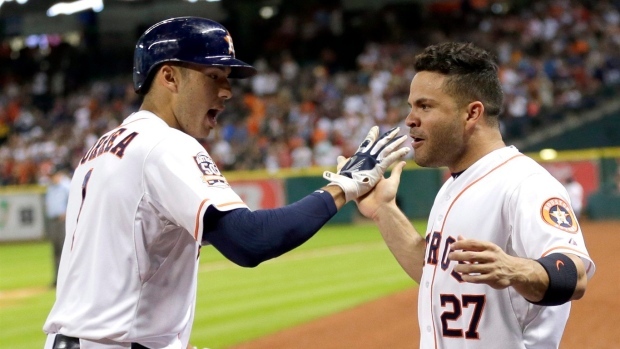 Conger hit two homers, including his first career grand slam, and rookie Carlos Correa also homered twice to help the Astros to a 9-2 win over the Arizona Diamondbacks. "I thought we'd hit a couple to be quite honest with you," Conger said. "But somebody told me after the game and I was kind of shocked." Dallas Keuchel (13-5) allowed two hits and two runs with eight strikeouts in six innings to extend Houston's lead in the AL West to three games. It was the major league-leading 44th multi-homer game Houston, which leads the majors with 147 home runs. The Astros were up by 1 with one out and the bases loaded in the fourth inning when Conger connected off Jeremy Hellickson (7-7) to push the lead to 7-2. Facing the Astros for the first time, Hellickson yielded seven hits and seven runs in a season-low 3 1-3 innings as the Diamondbacks saw their season-long six game winning streak snapped. It's the first time he's given up three homers this season. "I just couldn't get the ball down," Hellickson said. "I left a lot of pitches up over the plate, and I just couldn't make a big pitch when I needed to." Carlos Gomez had three hits in his second game with the Astros since a trade from Milwaukee on Thursday. Saturday was Keuchel's 33rd straight game with at least six innings, which set a franchise record. Conger's first home run tied it 2-2 in the third inning. Correa extended the lead to 9-2 with his opposite field homer to the second row of the seats in right field off Josh Collmenter in the sixth inning. "It's not a secret we've got a great team," Correa said. "We've got one of the best teams in baseball and we're going to go out there and compete." It was the first career multi-home run game for both Conger and Correa. When asked what he thought of Correa's home runs Conger joked that they talk about Correa too much before raving about the 20-year-old rookie sensation. "Carlos, gosh, he just keeps doing things amazing ... such a young age," Conger said. "The power he has foul pole to foul pole, it's been fun to watch." Chris Carter drew a bases loaded walk with one out in the fourth inning to put Houston up 3-2. Jose Altuve singled after the slam by Conger and Gomez followed with a double to chase Hellickson. Gomez, who went 0-for-5 in his debut on Friday, snapped an 0-for-13 slump with that hit. He added a single before Correa's second homer. Correa launched his 11th homer of the season into the Crawford Boxes in left field to give Houston a 1-0 lead with two outs in the first inning. Jarrod Saltalamacchia's RBI single with one out in the second inning tied it at 1-all. Cliff Pennington walked to load the bases with two outs and the Diamondbacks took a 2-1 lead when Ender Inciarte walked. Arizona rookie right fielder Yasmany Tomas was removed from the game in the middle of the sixth inning after not running hard on a groundout in the top of the inning. Diamondbacks manager Chip Hale didn't want to discuss the situation. "You know what, that's between Yasmany and myself," Hale said. "We take care of stuff inside the family here." When asked about the play Tomas said: "When the first baseman touched the base, I stopped." Hale said he'd be back in the lineup on Sunday. Diamondbacks: OF A.J. Pollock was out of the lineup on Saturday after leaving in the seventh inning a night before with tightness behind his left knee. Hale said Pollock was feeling better on Saturday but that he'd probably be on out again on Sunday to give him time to rest. "We'd rather catch it now, give him two or three days off than have to put him on the DL and miss a month," Hale said. Houston's Collin McHugh (12-6) opposes Robbie Ray when the series wraps up on Sunday. McHugh is looking for his fourth straight win and to tie Keuchel for most wins on the team.